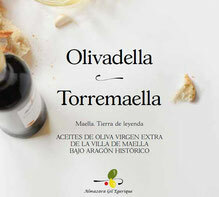 Our commitment to excellence and quality has inspired our family to create a self production of olives which has been driven by the plantation of our family-owned estate Vall d´Algés. In this valley of unique beauty the wisdom of centenary olive trees dwell together with the strength and energy of young Arbequina olive trees. 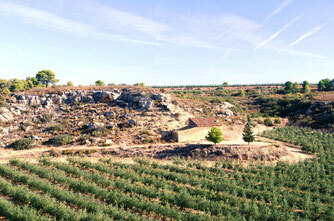 Our treasure is a small plantation of Tosca olive trees which is the first one of this variety to be planted in Spain. This variety offers delicious, juicy olives of exceptional organoleptic qualities and it has been praised by the best olive oil experts. Of calcareous, clay soil, Vall d´Algés is surrounded by wonderful and extensive pine forests, rosemary and thyme wild bushes which provide the olives with delicate flavours and subtle nuances. Empeltre is a variety of olive tree which is autochthonous from Bajo Aragón. These robust olive trees were introduced in our area during Roman times. 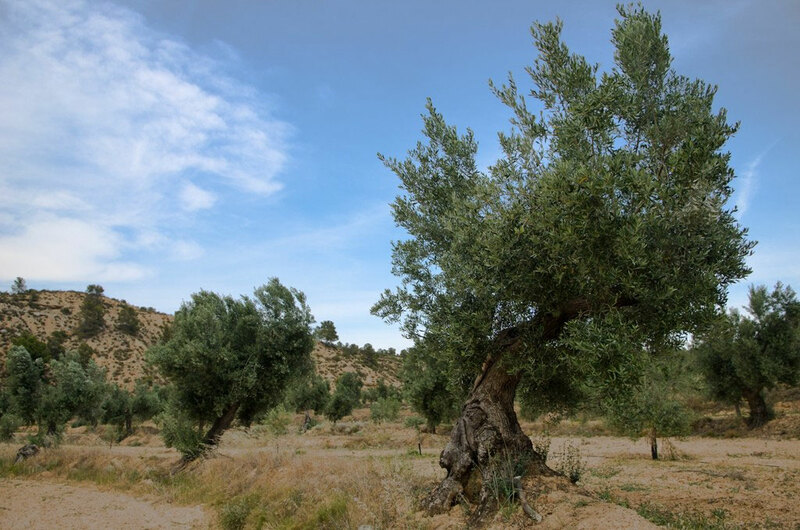 In their millenary existence Empeltre olive trees have witnessed all the vicissitudes of the history of our region, and that is the reason why we have incorporated this name into our dialect in which the word ´Empelt´ simply means olive tree. Empeltre olive trees are very productive (when it rains sufficiently) and of early fructification. They produce beautiful black olives that we marinate in salty water, exactly as our ancestors used to do, to obtain the deliciously renowned Negra Aragón black olives. Expert farmers for more than 30 years, at Almazara Gil Egerique we are always at the forefront in technological development and olive tree treatment. This expertise allows us to offer the highest quality with the minimum environmental impact. 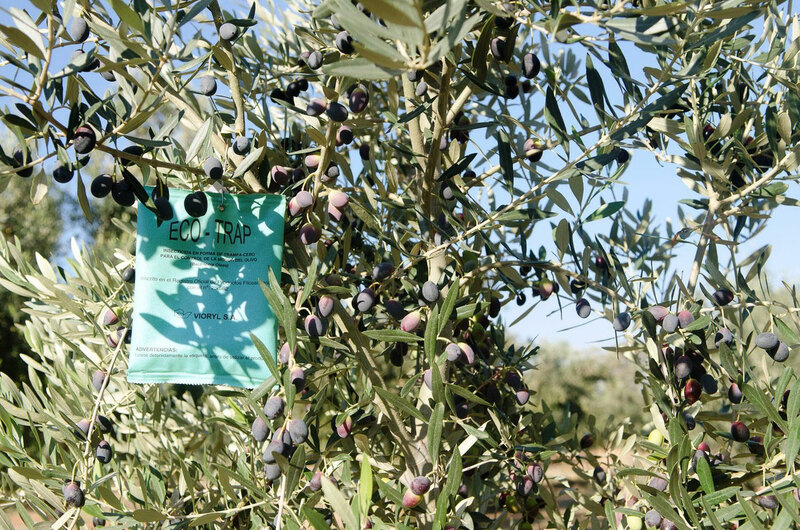 Following this philosophy we carefully program the olive treatment calendar and incorporate the latest trends in the sector. An example of our commitment to the environment is the use of Eco-Trap, a new ecological method which does not contain any pesticides or chemical components and serves to capture Bactrocera oleae, commonly known as the olive fly, which is the greatest threat to the olive tree. Eco-Trap ® consists of a green wrapping paper (15x20 cm) containing ammonium bicarbonate (food attractant), externally impregnated with deltamethrin (insecticide). Each wrapping paper is accompanied by a Bactrocera oleae pheromone dispenser. This way the flies are attracted and trapped in the Eco-Trap ® avoiding the use of pesticides in the ground or sprayed on the tree.